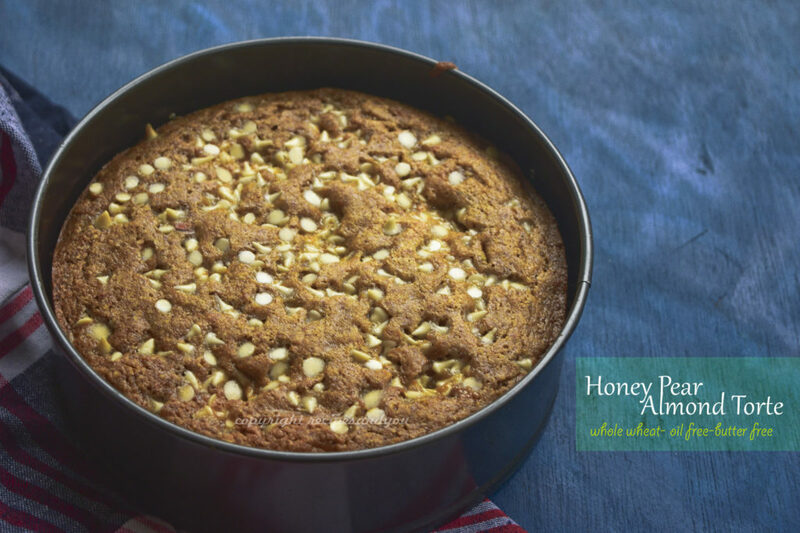 Honey pear almond torte is a cake made with almonds, pear pulp and honey. A perfect combination of health and divine flavor. 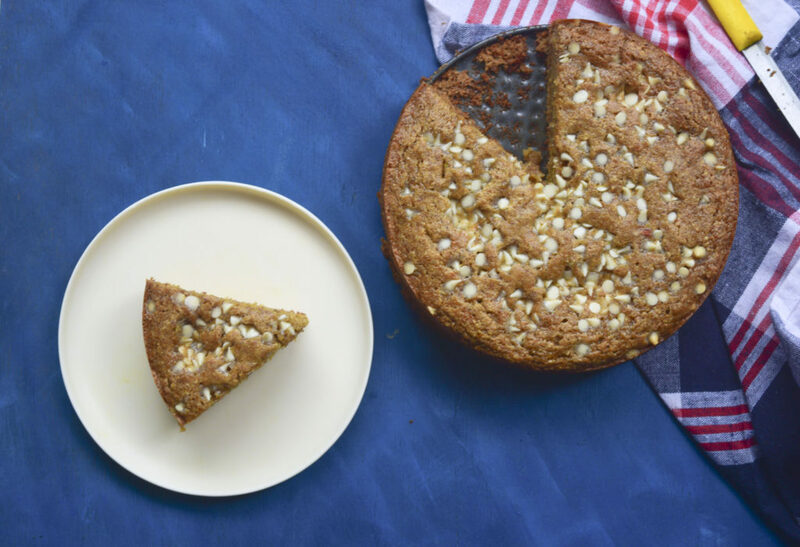 Seasonal produce and fresh ingredients always create magic.But this torte definitely is the epitome of flavors and healthy eating .You can also make it gluten free by replacing the whole wheat flour with soy flour or any other gluten free flour. It came out so soft and spongy without any addition of fat.Yes! It’s a butter free and oil free torte. Very soft , spongy and just melts in mouth. 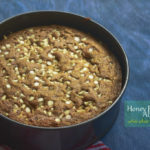 Unlike others, this cake tastes best if served hot.So there is no need to wait once it comes out of the oven.You can serve it straight to your guests with cream fraiche or whipped cream or any favorite ice cream. 3 small Pear take the fresh green pear.I took the fresh,firm pears.Not the soft ones. 1 cup almond roasted and salted ones. Separate the egg yolks and egg white. Mix together: egg yolks, baking powder, baking soda, pear pulp, vanilla essence. In a mixer attachment grind together: sugar, salted and roasted almonds and walnuts. Add this to the egg yolk mixture and mix well. Now, sieve the 1 cup whole wheat flour and then gently fold in the flour in the egg yolk mixture. In the end- Gently and gradually fold in the egg whites , 1 scoop at a time, without deflating the air in it. Pour the mixture in the cake pan and sprinkle the white chocolate chips over it. Bake for 55 minutes @ 165 degrees Celsius. Serve hot with cream fraiche or whipped cream or any ice cream of your choice. yes shilpa you can, although i havnt tried it myself but condensed milk or yogurt are good egg substitutes. This looks lovely! And it sounds so simple to make. Thank you for sharing! Such a lovely cake Aditi. . .perfect for fall. I can practically smell the sweet smell of the pears baking in the oven. The perfect companion to my afternoon cup of tea. thanks Lynn. Glad you liked it. Love the simplicity of this torte. No fuss with frosting, but totally delicious. I can see me eating this for breakfast LOL!! Am so glad you liked gloria. It is indeed so delicious that you might do that.lol. Love the fruit and nuts! 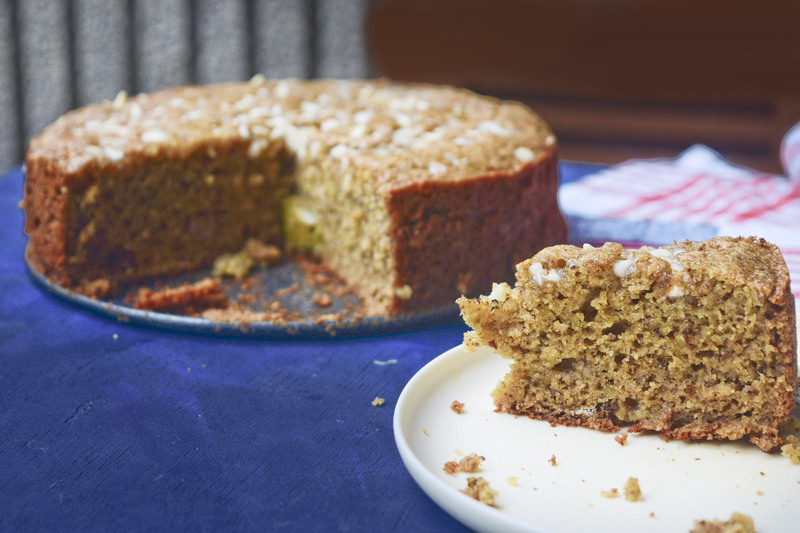 I’d probably use a mix of millet and buckwheat flour to make it gluten free – and that should work beautifully! i loveeeee tea time friendly cakes and this is right up my alley. This looks like a great fall dessert. I bet it’s moist and yummy. Yes its very moist . Thanks. Youll love it. Hope you try it soon. I love dessert with plenty of nuts mixed up in fruits! This cake looks lovely, I might try this out this weekend! Yum! I bet the house smells so good when this is in the oven! Pear and almonds are such great Fall flavors, yum! I love to have something so comforting like this specially on the weekends! this torte looks so perfect and yumm! Lovely cake with unique flavors! Perfect for fall. These are the types of cakes I eat at breakfast, and I snack on during the day. I have every single ingredient to make it…I guess it’s going to happen!! Thank you! Thanks Nicoletta. Am glad you liked. Hope you try this soon.